Fair Trade Tuesday 9 - 5 p.m.
New Fair Trade items just Arrived!!! Salads - Spicy peanut noodles, Wild rice sesame chicken, Curry chicken, Tuna and red bean, Greek orzo, Asparagus and mixed tomato, Cauliflower and pea. Our speaker, a naturalist, author and world traveler, who has been a hedgewitch for twenty years, will share her perspective on the spiritual ramifications of the connections between humans and nature in terms of how humans traditionally interact with the world. The powerpoint slides accompanying her presentation contain ideas and images that may not be suitable for young children. Ligonier, proceed east on Route 30 for approximately 1.5 miles. We are on the right side of the road just beyond Ligonier Valley Beach. Coming from the east we are about 2 miles west of Laughlintown on the left side of Route 30. Look for a large blue sign with white lettering. 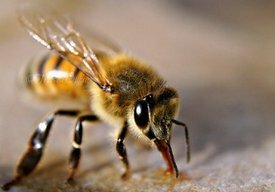 In an historic vote on Monday the European Union banned the use of bee-harming pesticides across the continent for a minimum of two years, garnering praise from environmental groups who have said that the population of the vital pollinators, along with the global food supply are in grave danger, due to the widespread use of the chemicals. The vote is the first of its kind and suspends three of the world's most widely-used pesticides—known as neonicotinoids. However, critics have said the two year suspension is not enough, meaning bees are not safe until the chemicals are banned permanently. Three out of every ten bites of food you eat depend on these beautiful, shy creatures. They are not the wasps and hornets who sting you and buzz around your sodas in the summertime; honeybees in fact die when they sting, so it's with great reluctance that they do so. (Stay away from the hives.) There is no reason to fear them, to hate them and to participate in annihilating them with chemicals. 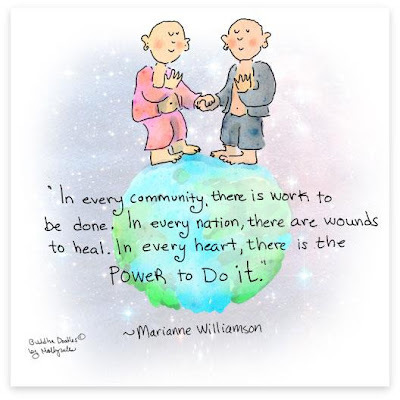 Stop spraying weeds; start supporting non-chemical solutions to life. Our food system depends on it. 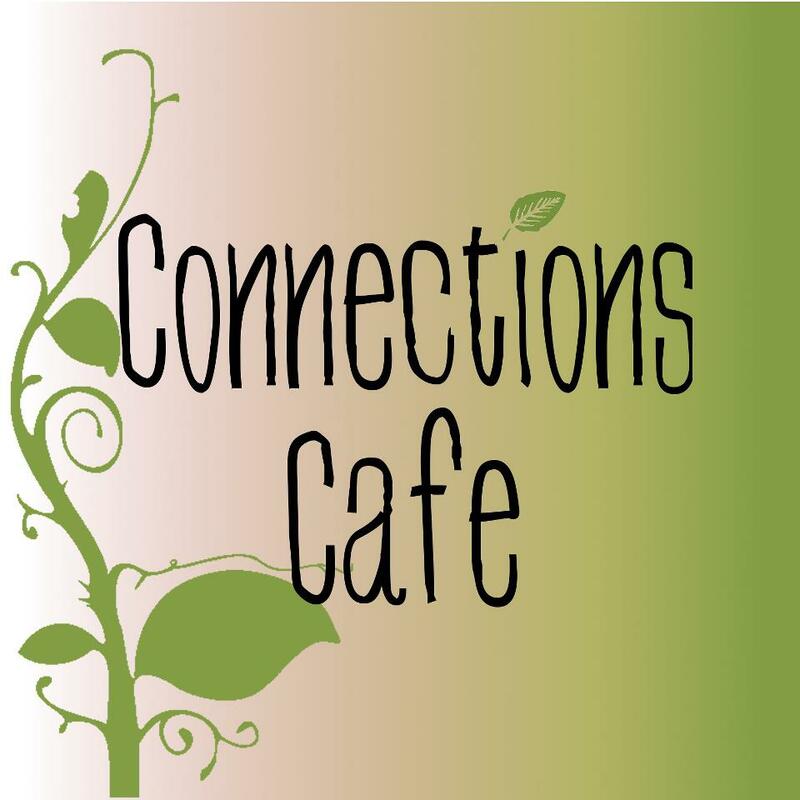 Enjoy healthy salads, yummy desserts, hot soup and grilled cheese at Connections Cafe while listening to an eclectic musical and reading open stage. Of Pennsylvania’s 687 high schools, nine received gold medals; 60 received the silver award; and 99 were awarded the bronze, Oldham said. Ligonier Valley ranked 1,756th nationally and 51st in Pennsylvania, she said. High school Principal Tim Kantor is proud of the achievement and credits the success to the hard work of the students and teachers, she said. Mellow Mike 6:30 to 9:30 p.m. The security incident happened on the Tennessee River side of the plant property, more than a quarter mile from the plant's protected area, which houses its reactor and power production facilities. This week in Texas, a picture worth many thousands of words... . (By Alex Wong for Getty.) Melissa Stockwell reading the Pledge of Allegiance. The chemical industry has mounted an increasingly desperate lobbying effort against a ban on neonicotinoids, which have been in use for more than a decade. In March the top producers, Syngenta and Bayer, proposed a plan to support bee health, including planting more flowering margins around fields and monitoring for neonicotinoids." How close to schools and homes? One of the captions in the article is titled "Why was a plant that stored explosive chemicals allowed to be located so close to a school?" The article goes on to state. "Dallas County residents were at risk of a toxic disaster because outdated and haphazard zoning (insert Act 13 here, what governs fracking here in PA) has allowed homes, apartments and schools to be built within blocks (insert Act 13's 300 feet here) in some cases across the street from sites that use dangerous chemicals." 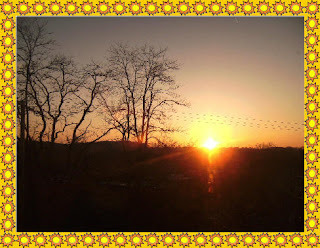 Shall we just cross our fingers, hoping no more explosions here in PA, or actually stand up to the Corbett administration -- and its lapdogs in Harrisburg, our senators and representatives -- and demand protection from the industrial accidents-in-waiting at frack sites? as minds turn to summer jobs....what job skills can you learn working in fast food? What do actress Andie MacDowell, Amazon founder Jeff Bezos and comedian Jay Leno all have in common? They all once worked at fast-food chain McDonald's. Despite the punch lines surrounding so-called dead-end jobs at fast-food restaurants, working at McDonald's has been the launching point for many a successful career. McDonald's employees learn a lot more than how to flip burgers and work the deep fryer, said Cody Teets, a 32-year McDonald's veteran and author of the new book, "Golden Opportunity: Remarkable Careers that Began at McDonald's" (Cider Mill Press, 2012). Teets started working at McDonald's when she was 16 and today is responsible for 800 McDonald's restaurants as vice president and general manager of the company's Rocky Mountain region. Teets said there are plenty of opportunities for learning life lessons while working in the shadow of the golden arches. Carolyn brings back memories of our planned climb of Mt. Katadin and why I never made it. There's a libertarian movement afoot. Ain't it sweet? There’s a movement afoot in the conservative ranks. Day by day, more young people are coming out as libertarians, confusing their friends and scaring their families. I am a libertarian, and increasingly, many conservatives are coming to the same conclusion. Some of us are socially conservative, god-fearing, “Reagan-ites.” Some of us are pro-choice and pro-gay marriage atheists who revere Thomas Paine and Barry Goldwater and think Reagan destroyed the ideology of the Republican Party. Some of us wear suits and ties, some of us wear muddy jeans and t-shirts. Some of us have never touched a gun, while some of us shoot regularly and open-carry. We, at Allegory Gallery, got 800 likes on Facebook! Hurray! Each time we get another hundred likes, we celebrate with a little giveaway. Up for grabs is a handmade, porcelain pendant/ornament. It has fine silver (99.9% pure) accents. Find out how you can win by CLICKING HERE. Stephanie will post more on that later. She got lovely threads for ladies. Some remind me of the garbs I wore in the 70s. Very cute. "Many survivors live in Massachusetts, a state that requires residents to have health insurance, "which should cover most of their required treatment," said Amie Breton, spokeswoman for Massachusetts' consumer affairs office. "The total cost of that treatment is impossible to calculate at this early stage."" "Ahead of an expected EU vote on Monday that will determine a possible ban on a class of pesticides that scientists say are killing off the continents' bees and other pollinators, a coalition of beekeepers, conservationists, gardeners, and environmental activists marched on Parliament in London on Friday as a way to urge the UK to join other European nations in supporting the ban. 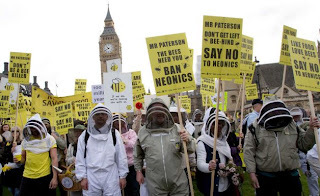 "Ministers can't ignore the growing scientific evidence linking neonicotinoid insecticides to bee decline," said Friends of the Earth's campaigns director Andrew Pendleton. "Their claims to be concerned about bee health will ring hollow if they fail to back European moves to restrict the use of these chemicals." He continued: "If we lose our bees and other vital pollinators it'll have a devastating impact on our food, gardens and environment. We urgently need tougher pesticide restrictions and a British Bee Action Plan to tackle all the threats they face." Underlining the urgency of the threat on Friday, Greenpeace's Graham Patterson issued a stark warning: "This is not abstract theorizing. Bees are dying out. Now." Ligonier Camp and Conference Center is hosting a fair trade sale to benefit artisans and raise money for our camper scholarship fund, and the community is invited. It will take place in fellowship hall at Covenant Presbyterian Church from 12-2 PM, featuring beautiful, ethically-sourced handmade merchandise from Ten Thousand Villages. We'll have jewelry, scarves, home goods, artwork, journals, toys, and more, and credit cards will be accepted. It will be perfect place to pick up teacher gifts or something for Mothers' Day. A simple soup and salad lunch is available for $5 (cash), but no reservations are needed. Bring a friend, and we'll see you soon! 5000 US troops going into Syria? Mountain Palace - Sunshine Club! Mexican Night Tonight!!! 5 - 9 p.m. Menu includes Taquitos, Tacos, Enchiladas, Chile Rellenos, and Fried ice cream. Light Breakfast 9 - 11 a.m. Healthy lunch 11 - 5 p.m. Call 724 238 9611 for take-out (plates and party size), small group gathering reservations, catering service. 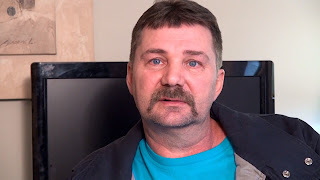 Joseph Giovannini: "...these conditions make it very hard for me to understand why these jobs and this money is so important to these people while it's ruining my life." Jodi Borello: "It's a nightmare." Randy Moyer: "I can't drink gas, and you're killing my water." "A truck carrying cuttings from a fracking site south of Pittsburgh was quarantined at a hazardous-waste landfill and sent back after its contents triggered a radiation alarm showing the load was emitting 96 microrem of radiation per hour; the landfill rejects waste with levels above 10 microrems. The radioactive material from a site in the Marcellus Shale formation was radium 226, a common contaminant from the decay of uranium-238 that tends to accumulate in bone and can get into water. 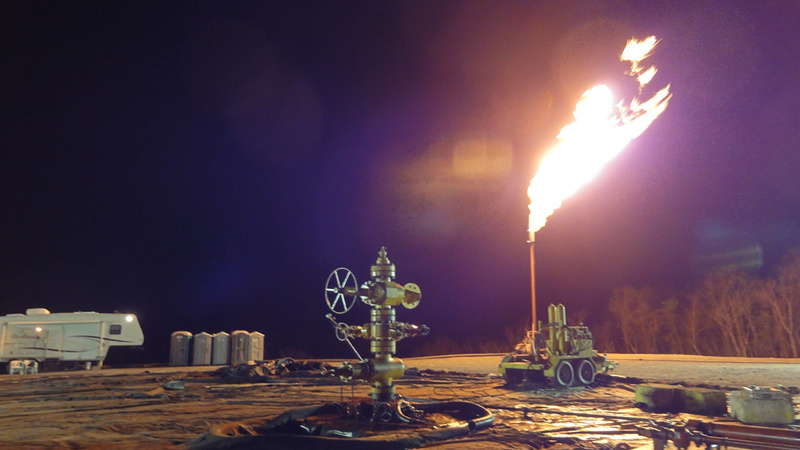 Officials said “everything was by the book in this case" because the alarm went off as designed; the fracking operators can now either re-apply at that landfill or take their deadly waste to an out-of-state facility that accepts it - and yes, they exist. The scariest thing here: Pennsylvania, which is currently studying radiation contamination associated with fracking wells, claims to be the only state that even requires landfills to monitor radiation levels. *Gives the industry time to leave and deny responsibility...such an old trick of the business trade. 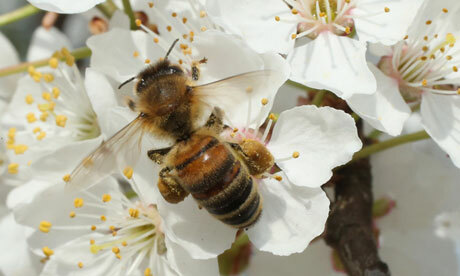 ...a quarter of the American diet, many of our fruits and vegetables especially, rely on pollination by honeybees. But something is killing them at an accelerated pace and it's getting worse. Forty to fifty percent of the hives have been wiped out. 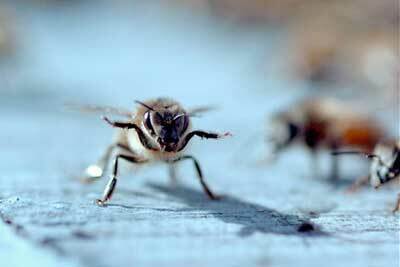 "(H)oney bees are, like everything else on our planet, under all kinds of duress. The world in which we jointly inhabit is changing with enormous speed, so none of the patterns that any of us are used to exist in same way anymore. Bees are under threat because landscapes keep changing, we get better at everything that we do and take more cutting of hay, and so we leave less time for clover to just sit there in the field. Life is speeding up for the bees just like it is for us and really neither us is coping very well with the results of that. So, what we could do to help bees is exactly what we can do to help ourselves: Slow down the pace of change in the world around us. Human societies aren't going to be able to cope with rapid climate change and neither can most animal societies, bees included. Human societies can't cope, turning everything into monoculture, neither can bees, they are a remarkable reminder for the need for a certain kind of stability, in terms of things like climate and the need for a certain kind of variety, in terms of landscape and what's around us. We need to be making at this point in our society some wise decisions about the years ahead and so we need to be using some of that same focused and determined decision making that bees has successfully employed over a great many millennium." One week later, the fires are out, most of the funerals have been held, but major questions remain unanswered. A team of up to 70 investigators is probing the source of the explosion. Reuters reported last Saturday that the plant had on site 2,700 tons of ammonium nitrate. This is 1,350 times the amount that would require a facility to self-report its stockpile to the Department of Homeland Security (DHS). Ammonium nitrate is a fertilizer used in industrial farming worldwide, and is stable when properly stored. It can be highly explosive when ignited, especially when mixed with fuel, as Timothy McVeigh demonstrated with the 1995 bombing of the Murrah Federal Building in Oklahoma City. 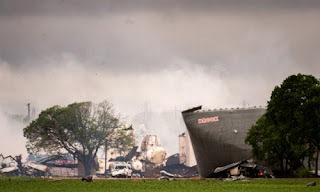 West Fertilizer Co never reported its ammonium nitrate to DHS. The concern with theft of ammonium nitrate by potential bombers is the basis for this reporting requirement. Numerous other federal and state agencies are supposed to regulate fertilizer plants, chemical storage facilities and workplaces in general." Regulations are meaningless if they are not enforced. 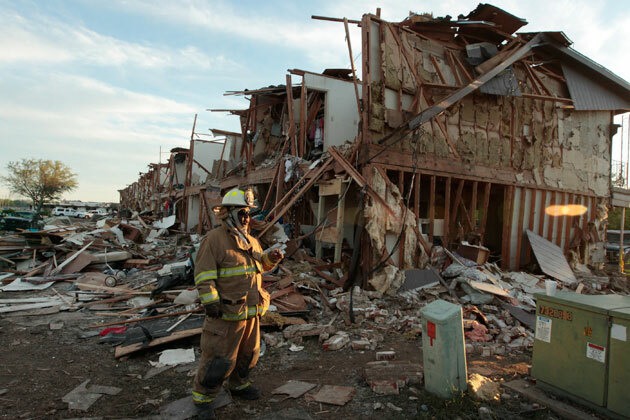 "There are 2,200 inspectors in this country, OSHA inspectors, for eight million workplaces. Due to the understaffing of OSHA, OSHA could inspect a plant once every 129 years." Get ready....tomorrow is Mexican Night !!! Authentic Mexican food being served every Friday 5-9 p.m.
Open daily for breakfast 9 - 11 a.m.
Thursday Healthy Lunch Menu 11 - 5 p.m.
2 weeks until Grilled pizza night! Call 724 238 9611 for take-out, party reservations, catering service. lots of private donations sought for Weller Field...what do you think? The Ligonier Valley High School Football Boosters hope to raise more than $1.4 million to replace the football field, resurface the track and install a new press box at Standard Bank Stadium in Ligonier, the home of Weller Field. “A state-of-the-art facility won't only benefit our athletes and our school district, but the whole community. The district could host band competitions and playoff games, which will bring people into town to shop at our businesses and eat at our restaurants,” said Christy Boyd, treasurer of the boosters. Several boosters members met with Athletic Director Brett Miller, Maintenance Director Bob Losier, school Director Irma Hutchinson, who heads the district athletic committee, and former high school principal Ron Baldonieri last year to discuss what was needed at the field. My thoughts are...it's the right of an individual to give freely to any cause they wish to support. Just do NOT take money from taxpayers for this project. Personally I think that kind of money would be better spent completing the Ligonier Valley Trail system. Now THERE'S a project that will bring more people to Ligonier once the trail connects SAMA and Laughlintown and Idlewild Park, don't ya think? Six Ligonier Valley museums will offer free admission to all visitors on May 5. Special programs and a variety of activities will be provided at the local historical and cultural landmarks. People have a right to know...we are guinea pigs right now. "The growing fight to label genetically modified food (GMOs) came to Maine's capital on Tuesday as hundreds of right-to-know advocates denounced being part of the biotechnology industry's "lab experiment" and added vocal support to a proposed GMO-labeling bill in the state. "If you're going to engage the American public, and the people of Maine, in a lab experiment, you know, it's my opinion that perhaps they ought to know they're in that lab experiment," said Rep. Lance Harvell (Republican-Farmington), sponsor of L.D. 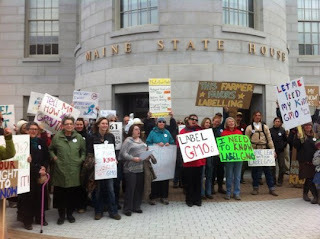 718, An Act To Protect Maine Food Consumers' Right To Know about Genetically Engineered Food and Seed Stock, testifying before the Legislature's Agriculture, Conservation and Forestry Committee in Augusta. "We're all guinea pigs and we're consuming this food and many people don't know this technology is being foisted upon them," said Heather Spalding, Interim Director for the Maine Organic Farmers and Growers Association. “The scientific uncertainty surrounding GMOs is a good reason for the state to require labeling,” Harvell stated in a press release from the Maine Organic Farmers and Gardeners Association. “Consumers have a right to know what they are eating and to make informed choices about the health risks they take with products that are not subject to federal safety testing." "If you are spraying pesticides and using fertilizers like Miracle Gro, you are dissuading the fungi," Mr. Cosby said. Mr. Lowenfels and Mr. Lewis write in "Teaming With Microbes: A Gardener's Guide to the Soil Food Web": "Rototilling breaks up fungal hyphae (filaments), decimates worms and rips and crushes arthropods. It destroys soil structure and eventually saps soil of necessary air." Read more on how to garden without tilling and wrecking your soil at http://www.post-gazette.com/stories/life/garden/expert-warns-against-tilling-soil-684237/. Online sources for it include Fungi Perfecti at fungi.com; Mycorrhizal Products at mycorrhizalproducts.com and Peaceful Valley Farm Supply at groworganic.com. is being donated to our trail project. Is there something you can do for the trail to make it better? Be at the Ribbon Cutting Saturday April 27th at 9:30 AM to find out more. 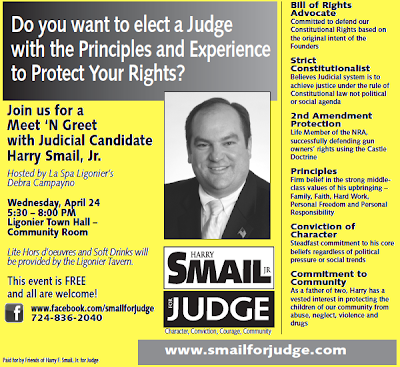 This evening La Spa Ligonier is hosting a Meet 'N Greet at Town Hall with Judicial Candidate Harry Smail Jr.
Hors d'oeurves and drinks will be provided by the Ligonier Tavern. This event is going to be a relaxed, fun, and informative. We look forward to seeing you there! Wed. April 24, 2013 5:30-8:00pm. OPEN INVITATION. No RSVP needed. Midweek treat...... dining and shopping at the same time. Are you looking for a unique gift? Well, Connections Cafe may have it for you in their hand selected, unique Fair Trade store. Stop in to browse the shop while you dine! Wednesday Healthy Lunch Menu 11 - 5 p.m. Call 724 238 9611 for take-out and party reservations. Love the new bridge, and saw a lot of folks using the trail last Sunday. "It's fascinating to see that this is happening at the same time that there's a growing youthful libertarianism, even among people who don't self-identify as libertarians. And that's not a Republican thing, and it's not a conservative thing at all. It's a strange tension where applied libertarianism in politics right now is an almost exclusively Republican phenomenon... but actual libertarianism in the country might be as much left of center as it is right of center, and it aligns on issues like war, civil liberties and drug legalization." 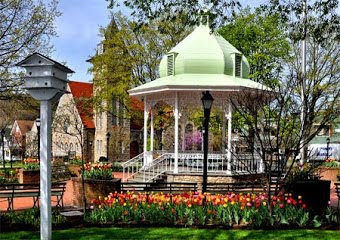 lots of info on Ligonier...Hubby wanted to share this site with you. 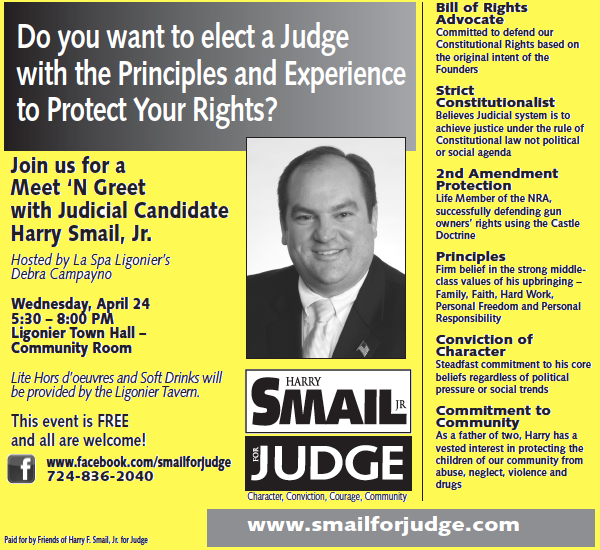 La Spa Ligonier invites YOU to join us for a Meet 'N Greet at Town Hall. This is going to be a relaxed, fun, and informative event. We look forward to seeing you there! Wed. April 24, 2013 5:30-8:00pm. OPEN INVITATION. No RSVP needed. Tempting Tuesday at Connections Cafe. Did you know that Connections Cafe has over 25 kinds teas? Herb teas, Green teas, White tea and yes, of course, Black teas strong enough to get you going and keep you going throughout the day. Each tea is hand selected by the owner, Sharon Detar. Stop by and try to choose just one. And now for today's great eats! Healthy Lunch Menu 11 - 5 p.m.
We already have an internet sales tax in PA....it's called sales and use tax. That's right. If you buy anything anywhere - including on the internet - that would be taxed if you bought it in PA, and you intend to USE it in PA, then folks, you have to pay the tax. WHAT? That's right. We found out the hard way when an auditor came to our office from the PA Treasury Dept. The computers and office supplies we bought on the internet were taxable! I asked and he said the law does apply to businesses and individuals. We now file a regular return and remit to PA a sales and use tax for items purchased outside of PA or on the internet. So, that begs the question, why would the USA need a law to allow states to impose an internet sales tax? Why don't states simply follow the lead of PA and tax for USE? 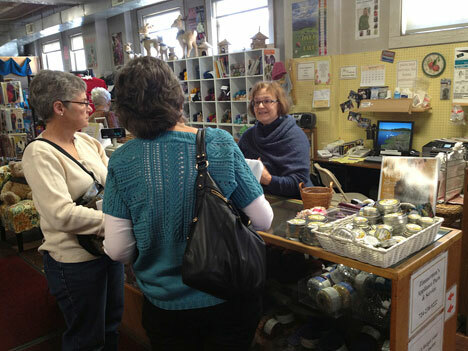 Sharon Detar, former manager, now owner of the Connections Cafe welcomes you to stop in and see what's new. "In a Democracy Now! exclusive on Earth Day, climate change activist Tim DeChristopher joins us for his first interview since being released from federal custody after serving 21 months in detention. 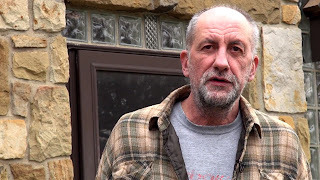 DeChristopher was convicted of interfering with a 2008 public auction when he disrupted the Bush administration’s last-minute move to sell off oil and gas exploitation rights in Utah. He posed as a bidder and won drilling lease rights to 22,000 acres of land in an attempt to save the property from oil and gas extraction. The auction itself was later overturned and declared illegal, a fact that DeChristopher’s defense attorneys were prevented from telling the jury. His case is the subject of the documentary, "Bidder 70," which will screen all over the country today to mark his release and Earth Day. The founder of the climate justice group Peaceful Uprising, Tim DeChristopher joins us to discuss his ordeal, his new-found freedom, and his plans to continue his activism in the climate justice movement." 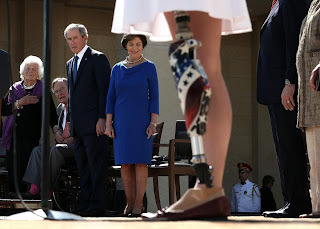 "Over the last two years, the US has witnessed at least three other episodes of mass, indiscriminate violence that killed more people than the Boston bombings did: the Tucson shooting by Jared Loughner in which 19 people (including Rep. Gabrielle Giffords) were shot, six of whom died; the Aurora movie theater shooting by James Holmes in which 70 people were shot, 12 of whom died; and the Sandy Hook elementary school shooting by Adam Lanza in which 26 people (20 of whom were children) were shot and killed. The word "terrorism" was almost never used to describe that indiscriminate slaughter of innocent people, and none of the perpetrators of those attacks was charged with terrorism-related crimes. A decade earlier, two high school seniors in Colorado, Eric Harris and Dylan Klebold, used guns and bombs to murder 12 students and a teacher, and almost nobody called that "terrorism" either." Some of the country's best and best-loved cartoonists, as fed up as the rest of us, have made a new short film demanding Congressional action to end gun violence. 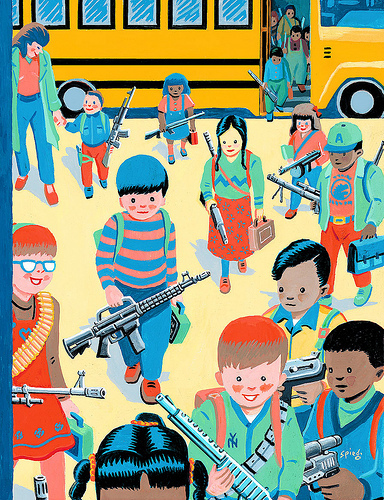 Sponsored by Mayors Against Illegal Guns. All of the work is original except a famous New Yorker cover by Art Spiegelman showing kids arriving at school armed to the teeth. Jarringly, it dates from 1993. Narrated by Philip Seymour Hoffman and Julianne Moore. 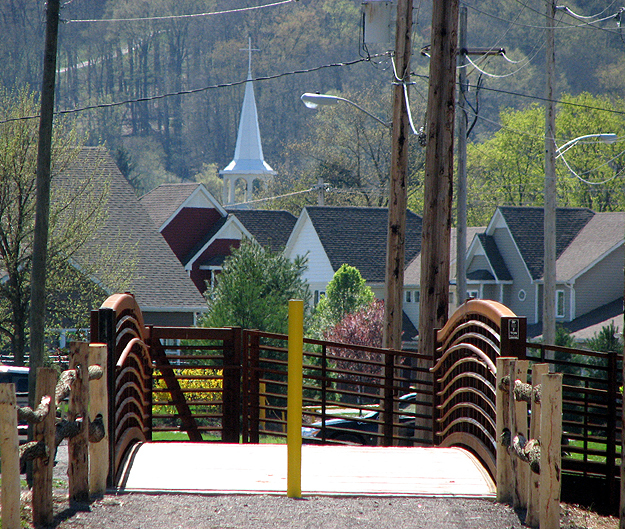 The community is invited by the Ligonier Township Recreation Board to the Saturday April 27, 9:30AM ribbon cutting at the new Pedestrian and Biking bridge over Mill Creek. The event will celebrate a cooperative effort between Ligonier Township, Ligonier Borough and the Loyalhanna Watershed Association to bring the Ligonier Valley Trail and the Mill Creek bridge to reality. Immediately following, there will be a walk on the rail bed to Peoples Road and back to the bridge(one mile). 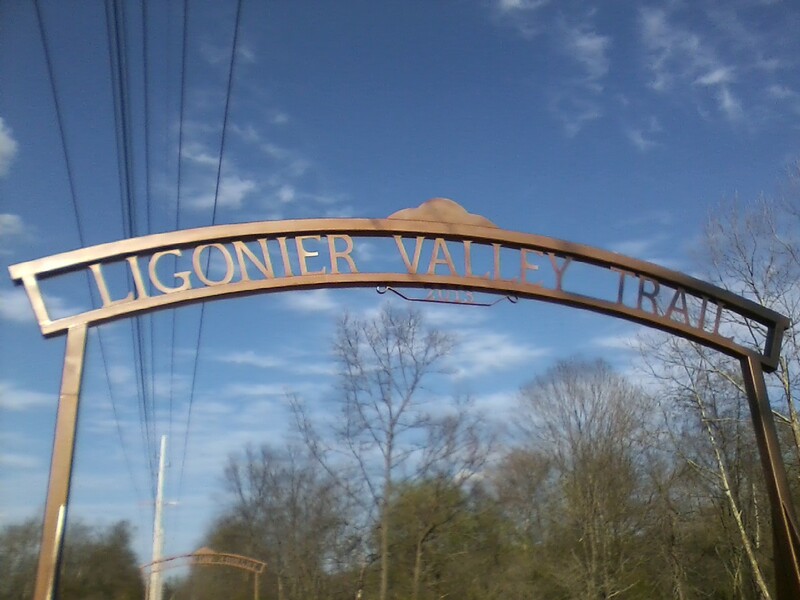 The Friends of the Ligonier Valley Trail and Recreation Board also invite anyone interested in becoming a trail volunteer or Ambassador to meet after the walk for a short organizational meeting near the bridge ramp. The bridge is located behind Weller Field and can be accessed from Boquet Street in Ligonier Borough. Please pass on the invitation to your friends in the community. Every Monday 6:30 to 9:30 p.m. Enjoy a relaxing evening with local acoustic performers, writers and artists in an informal setting as you dine. An open stage venue. Light dinner, desserts, locally roasted coffee and Fair Trade browsing available. BYOB establishment. No cover or bottle fee. 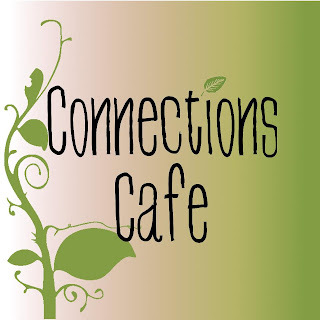 Mellow Mike will be at Connections Cafe in Ligonier tonight and every Monday 6:30 to 9:30. See you there! No cover or bottle fee. Mellow Mike @ Connections Cafe is underwritten by The Closing Specialists. I continue to believe that students at LVSD need to unplug and learn to socialize with real people and learn to use their brains without the assistance of a computer, smart phone or tablet. Outside of class students everywhere are attached to smart phones, laptops and tablets. This is not good and there is a real need to unplug and be human. I don't go along with the argument that student need to be taught computer skills. That is an old fashioned concept. 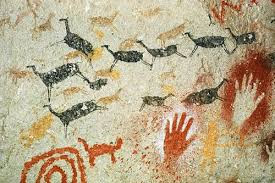 Today technology and software is constantly changing. 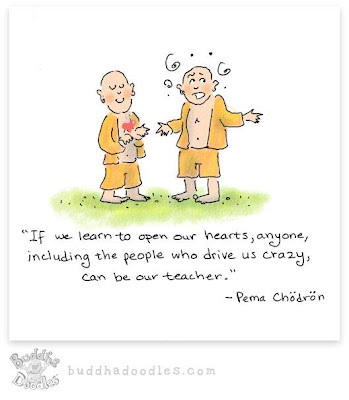 From year to year, month to month, it is constantly changing. Other than students who are being taught specifically how to program software or work on hardware, I believe the classroom ought to be unplugged. Adults making decisions to give young people more access to computerization are behind the times. There has been a paradigm shift. We need to look at this with a different perspective. Are we creating a member of a hive or are we creating an educated individual, capable of independent thought?